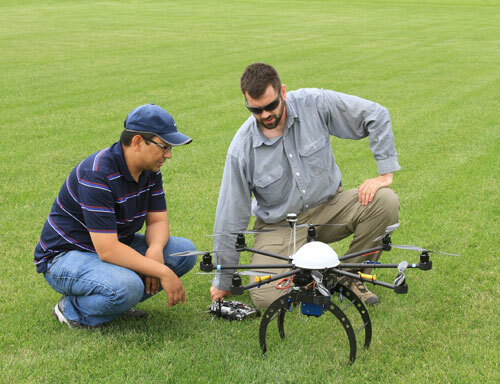 Bijesh Maharjan, a post-doctoral student, and Brian Krienke, a soils extension educator, both of the University of Nebraska-Lincoln Department of Agronomy and Horticulture, do checks on a UAV prior to a research flight. They have researched the use of UAVs using remote imagery as well as active crop canopy sensors to assess and manage nitrogen stress in corn. Agricultural research with unmanned aerial vehicles will be among the Nebraska Extension educational presentations at this year's Nebraska Power Farming Show. Dec. 9-11 at the Lancaster Event Center in Lincoln. Brian Krienke, Nebraska Extension soils educator, will discuss the use of unmanned aerial vehicles using a variety of sensor systems to investigate nitrogen and water stress of corn. Krienke also will be sharing preliminary information on other research uses of UAV-mounted sensor systems. UAV seminars will be daily in one of two seminar rooms north of the food court in Pavilion 3. While the Federal Aviation Agency (FAA) currently prohibits the use of all unmanned aircraft for commercial use without the agency's express approval, this presentation will provide the opportunity to learn more about how UAVs are being used in agricultural research. Also be sure to stop by the UNL Market Journal booth in Pavillion 3, featuring Nebraska Extension experts working with Market Journal, the Nebraska On-Farm Research Program, and soybean cyst nematode testing and management. Kreinke is one of several Nebraska Extension experts speaking at this year's show. All presentations are in one of two seminar rooms north of the food court in Pavilion 3.